Posted on March 31, 2015 November 14, 2018 by The Lint King Inc.
Is it taking too long to dry a load of clothes? will save you time and money with lower utility costs! The best way to prevent the possibility of a dryer fire harming your family is with an annual dryer vent inspection and cleaning by the professionals at The Lint King Dryer Vent Cleaning Services. Did you know that clothes dryer vents that go without regular cleaning, typically 1-2 years, can cost the homeowners many times the cost of a cleaning? Clogged dryer vents burnout dryer motors. 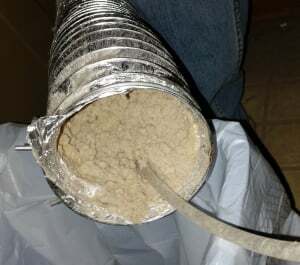 Dryer vent cleaning will prevent from overheating. A properly installed metal dryer vent system will ensure maximum airflow for best dryer performance. The Lint King is proud of its customer satisfaction record as demonstrated by the customer testimonials that we’ve received since 2005 from our dryer vent cleaning customers. The Lint King specializes in dryer vent cleaning and repair. Our Lint King dryer vent technicians are trained to look for all signs of airway constrictions. We are familiar with most manufacturers’ lint traps. For example, the Fisher&Paykel dryer pictured here has a 2-part lint trap requiring special tools to clean properly. The Lint King helps homeowners with an affordable solution to avoid a potential disaster. With annual inspection and cleaning, you can be confident that your dryer vent is operating properly. Click here for our special pricing and to schedule your next dryer and vent cleaning and inspection service. Schedule an appointment. We are frequently in Schaumburg, Elk Grove Village, Hoffman Estates, Bartlett, Roselle, Elgin, Bloomingdale, Arlington Heights, Medinah, Streamwood, and surrounding communities. See our complete list of dryer vent cleaning towns. Visit the Lint King dryer vent cleaning experts.